This is a sponsored conversation written by me on behalf of Folgers. The opinions and text are all mine. Did you know that this Saturday is National Coffee Day? Girlfriends, you know how much we love our coffee! 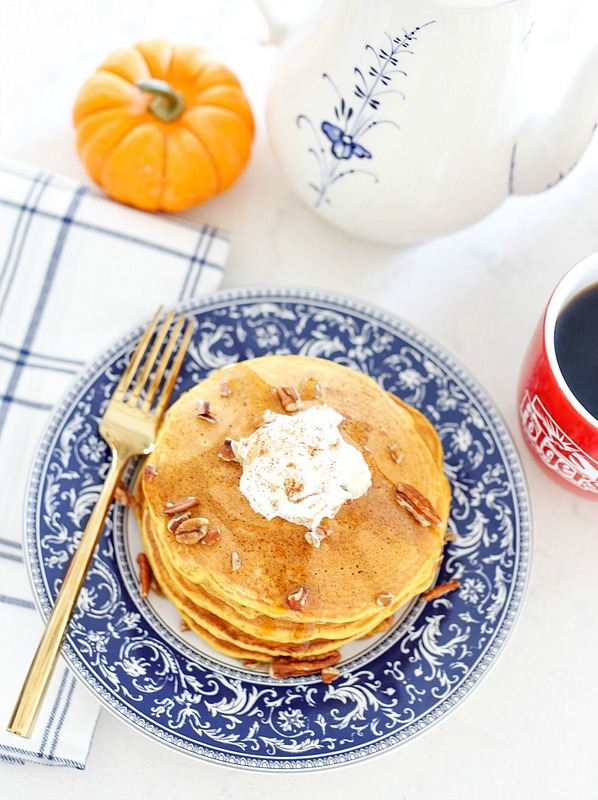 And because this fun little holiday is falling on a weekend, it is the perfect excuse to throw a little National Coffee Day Celebration with Pumpkin Spice Pancakes topped with maple syrup, pecans, and whipped cream for breakfast with the family! I rarely spend money at coffee houses these days. Why, you might ask? 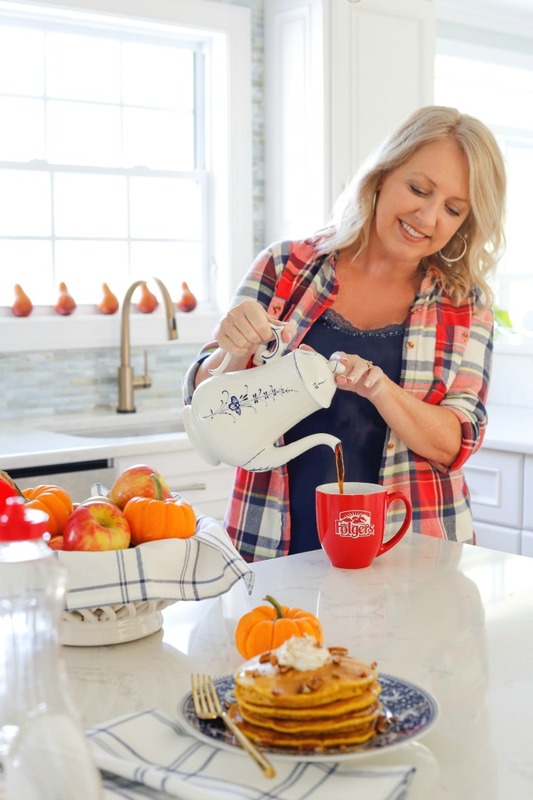 After Folgers® introduced me to their large variety of delicious and distinct roasts, I knew I was throwing my money away at the coffee houses and could make even better tasting coffee, for a fraction of the price at home! Our weekend morning routine starts with brewing a big pot of coffee for my hubs and I, and then we make some type of nice breakfast for the kids. Since we just kicked off the fall season, making a fall themed breakfast seemed festive! 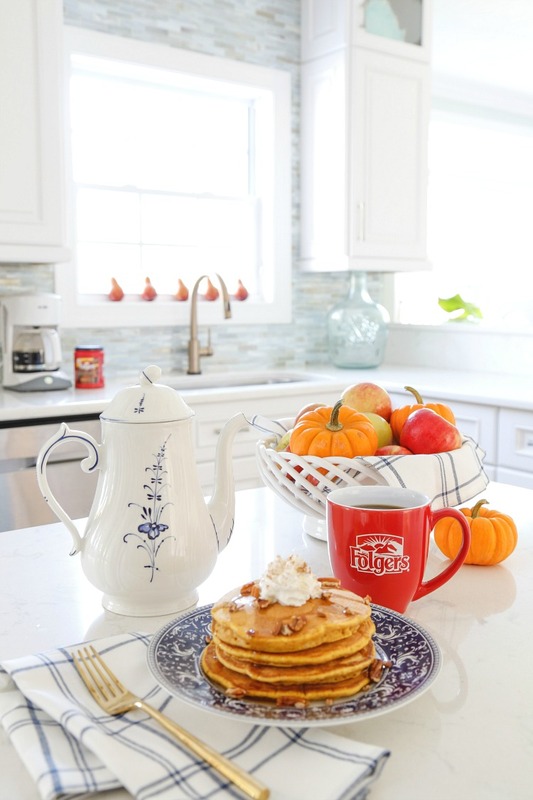 These pumpkin spiced pancakes paired with a cup of coffee sounded perfect to me. Folgers® Coffeehouse Blend Coffee is one of my favorites. No matter how you take your coffee, this roast’s smooth and bold finish still comes though and is the perfect blend to prepare with trendy brewing methods. I’ve used it to make my cold brew for iced coffee. For this celebration, I pulled out a beautiful wedding gift coffee pot to serve the coffee. These super fluffy pumpkin spice pancakes are incredibly easy to make. They have a nice pumpkin flavor without being overpowering and have just the right amount of spice. 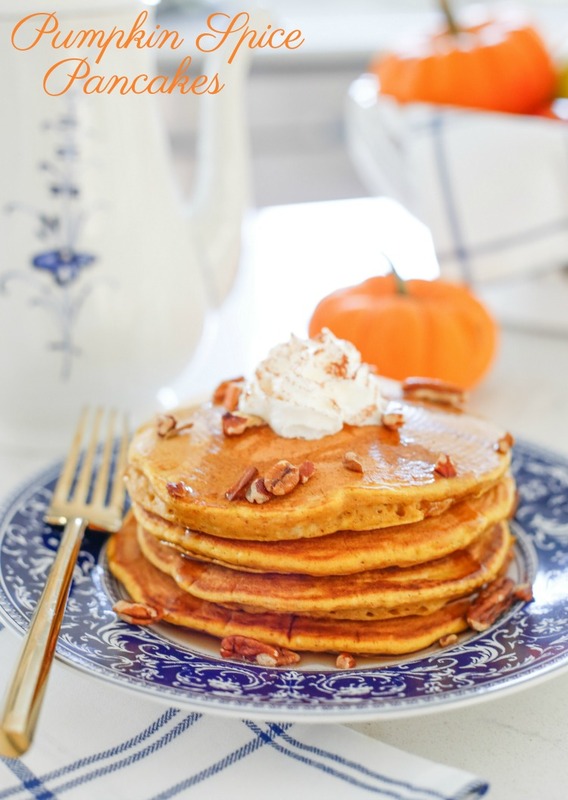 Topped with sweet maple syrup, toasted chopped pecans, and a dollop of sweetened whipped cream with a dusting of pumpkin spice makes these pancakes truly special! There is a printable recipe below for you. These pumpkin spice pancakes are easy to make and turn out so fluffy! They have a nice pumpkin flavor with just a hint of spice. They are perfect for any fall breakfast! n a large bowl mix eggs, milk and canned pumpkin until well blended. Add in the baking mix and pumpkin spice. Stir until combined. Do not over mix. The batter will look slightly lumpy. Heat griddle pan over medium low heat. Pour ½ cup portions of batter onto pan to create 5 inch round pancakes. Wait until bubbles appear evenly across the pancake surface then flip the pancakes and cook for an additional minute. Top pancakes with a sprinkle of chopped pecans, maple syrup, a dollop of whipped cream and a sprinkle of pumpkin spice. LOVE IT? PIN IT! 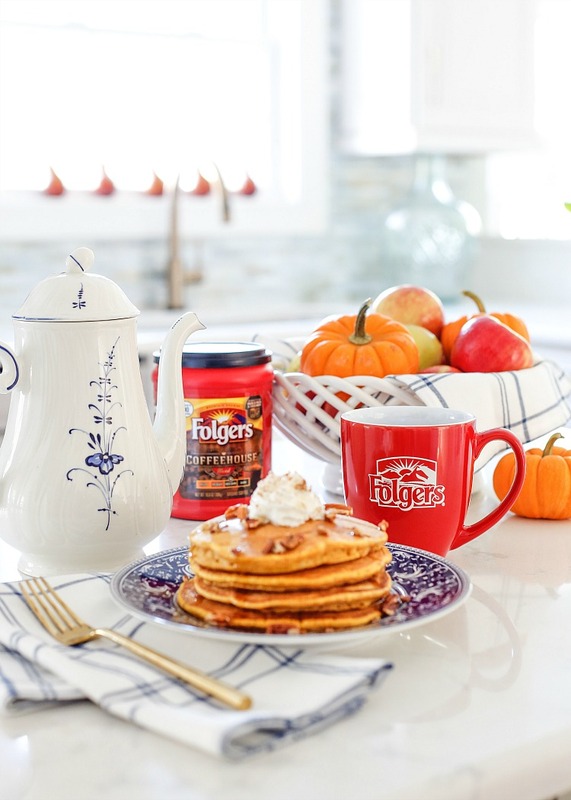 I hope you enjoy National Coffee Day with Pumpkin Spice Pancakes and Folgers®! Be sure to watch my Instagram Stories this weekend! I’ll be sharing some fun National Coffee Day celebration ideas! How will you be celebrating National Coffee Day? You might also like this idea for National Coffee Day! 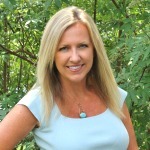 Hi Kim – wanting to try this recipe – but, what is all purpose baking mix? Not sure what to get! These pancakes look super yummy. Thanks for the recipe.